The parishioners of the Holy Family Church devoted a lot of their time and efforts to other activities, both cultural and spiritual. SWAPNA VIHAR - III (April 1972). All these three fetes had Mr. Sabu Rebello as chief coordinator. was held in 1986 with Mr. Caesar D'Costa as chief coordinator. system of sound and lights, conceived and planned by Mr. Eustace Fernandes, a friend and well-wisher of the Parish. 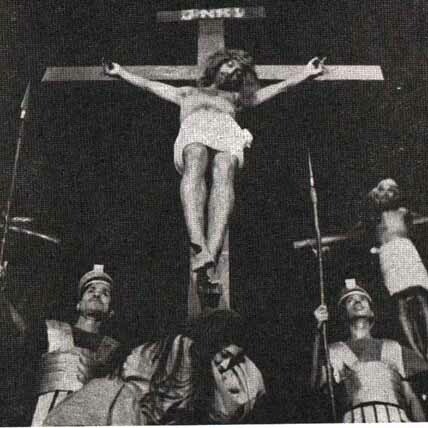 The script, music and direction was by Mr. Sabu Rebello, who also played the role of Jesus Christ. all running to packed houses (1965 - 1972). Shilpalaya Technical School was started in a structure constructed next to the Church to train and help mainly the youth of the Parish who have discontinued their formal education. This institute has since shifted to another building of its own in the neighbouring Vinayalaya grounds. same structure that was previously used by "Shilpalaya"
Snehasadan is the brain-child of Fr. Frances S.J., and was started in a small shed in the Parish to cater to the needs of boys who had strayed away from home and lived on and off the street. These boys were picked by Fr. Frances and his team, offered a roof, food and a chance of education, in order to improve their future. Since then, Snehasadan has grown in stature and has added a number of new homes catering not only to boys but also girls. This project has won and continues to gain national and international acclaim. confidence and ambition to strive to improve themselves and their environment.